Anna Althea Hills (1882-1930), Frances (1920), oil on board, 61 x 50.8 cm, Private collection. The Athenaeum. The nineteenth and twentieth centuries saw the rise of landscape as a genre, painting en plein air rather than predominantly in the studio, and the arrival of many more professional women artists. Anna Althea Hills (1882-1930) was one of the better women artists who specialised in painting landscapes en plein air in the early years of the twentieth century. Her particular strengths were her international training, great skill in painting with the knife, and unusually perceptive expression of the light of Southern California. Born in Ravenna, Ohio, her father was a minister, so the family moved to a different state every few years. She started her training at Olivet College in Michigan in 1898, and in 1902 studied at the Art Institute of Chicago. She then transferred to Cooper Union, New York, where she received her diploma in 1908, by which time she had already been teaching at Olivet. That year she moved to Paris, where she first studied at the Académie Julian, before moving to England as a pupil of John Noble Barlow, who was active in St Ives and Lamorna, Cornwall. Anna Althea Hills (1882-1930), Poplar House, Late Afternoon, Laren, Holland (1911), oil on board, 19.1 x 26.7 cm, Private collection. The Athenaeum. During her time in Europe, she also painted in some of the well-known artists’ colonies. 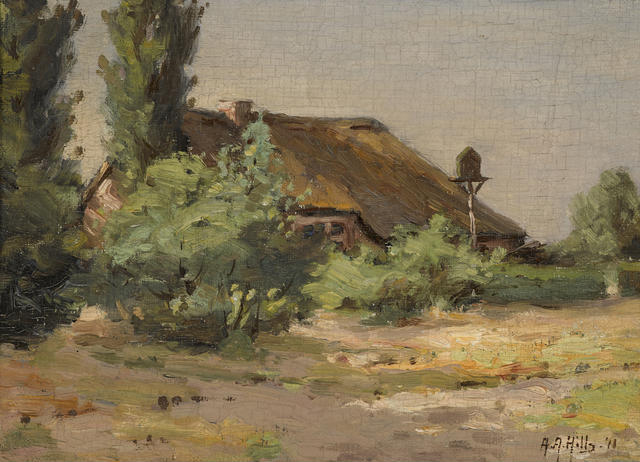 She was at Laren in Holland when she painted her Poplar House, Late Afternoon, Laren, Holland (1911) en plein air. Although her early works are hard to come by, she seems to have painted genre scenes, still lifes, and landscapes in a slightly muted impressionist style, often with quite dark tones. 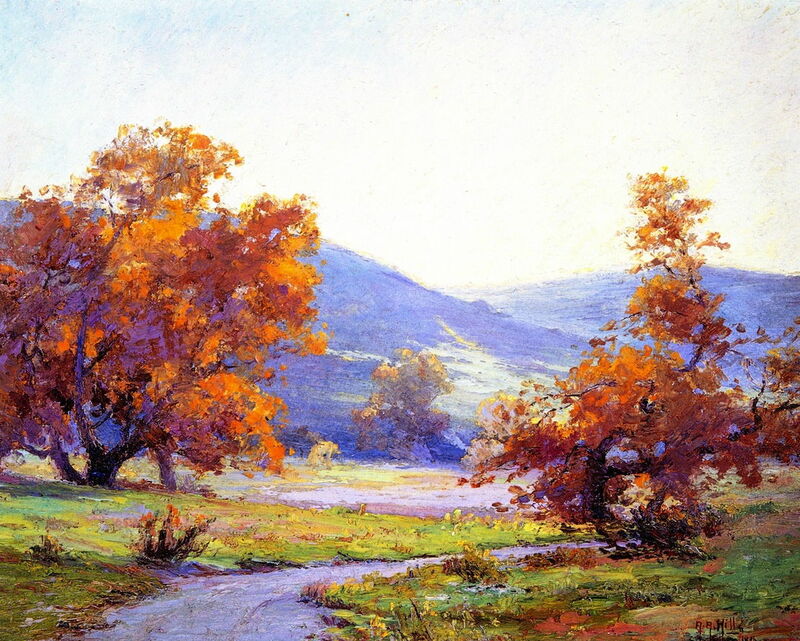 Anna Althea Hills (1882-1930), Morning Light, Verdugo Road, Los Angeles (1913), oil on canvas, 51.4 x 61.6 cm, Private collection. The Athenaeum. She returned to the US by 1913, first living in Los Angeles. 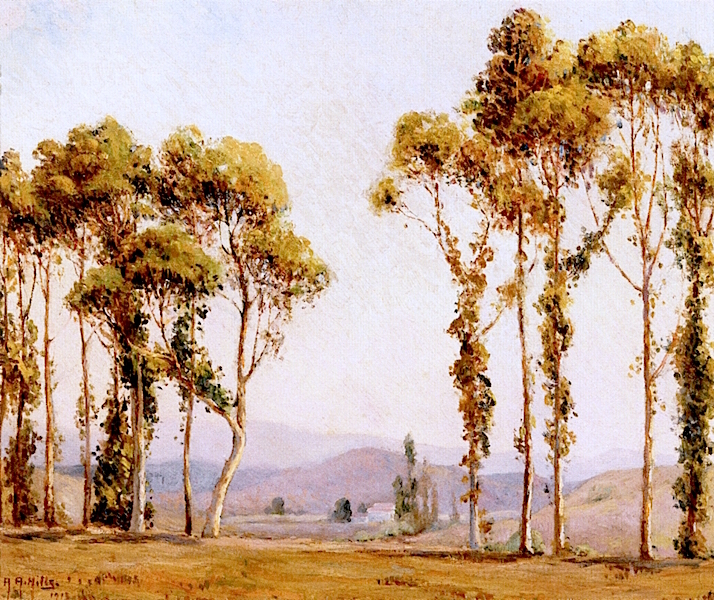 Her Morning Light, Verdugo Road, Los Angeles (1913) is one of her earlier mature works, and was probably based on initial plein air painting, then finished in the studio. This area has now been largely swallowed up into the northern edge of the city, on the eastern side of Glendale. She started to visit Laguna Beach while she was still living in Los Angeles, but soon decided to move there. In 1914, she and her sister (also unmarried) set up a studio and started teaching in Laguna Beach, where she remained for the rest of her life. By this time she had started to have solo exhibitions of her paintings in Kanst Gallery, Los Angeles. Laguna Beach had become a popular location for artists during the late 1870s, when they discovered its distinctive scenic beauty, which blends sea, mountains, and desert. As the Mediterranean coast of France became popular with European artists, Americans came to appreciate the similarities in light between this area in Southern California and the nascent resorts of the Midi. Anna Althea Hills (1882-1930), Montezuma’s Head (1915), oil on canvas, 76.2 x 101.6 cm, Private collection. The Athenaeum. Although she is best known for her small, plein air studies painted with a small palette knife, she also made some larger more finished works in the studio, including her Montezuma’s Head (1915). 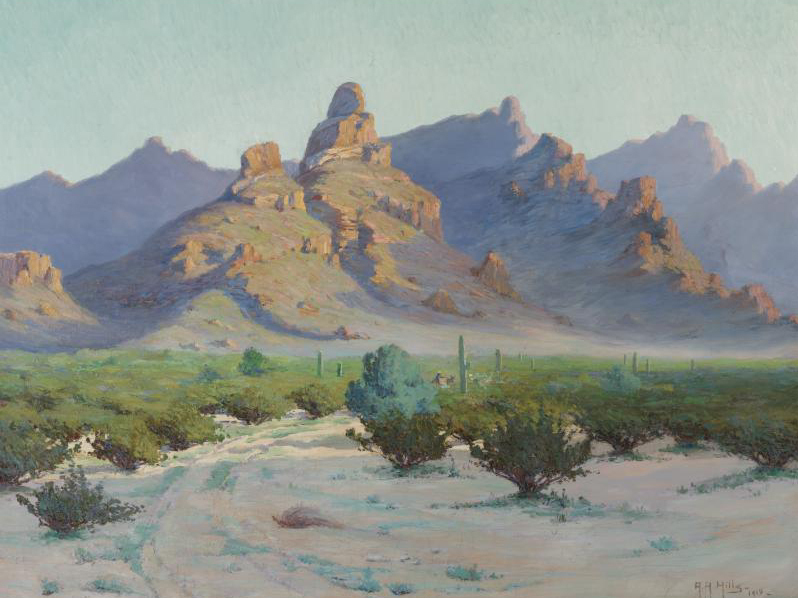 This was based on oil studies which she made of this area to the south of Phoenix, Arizona. 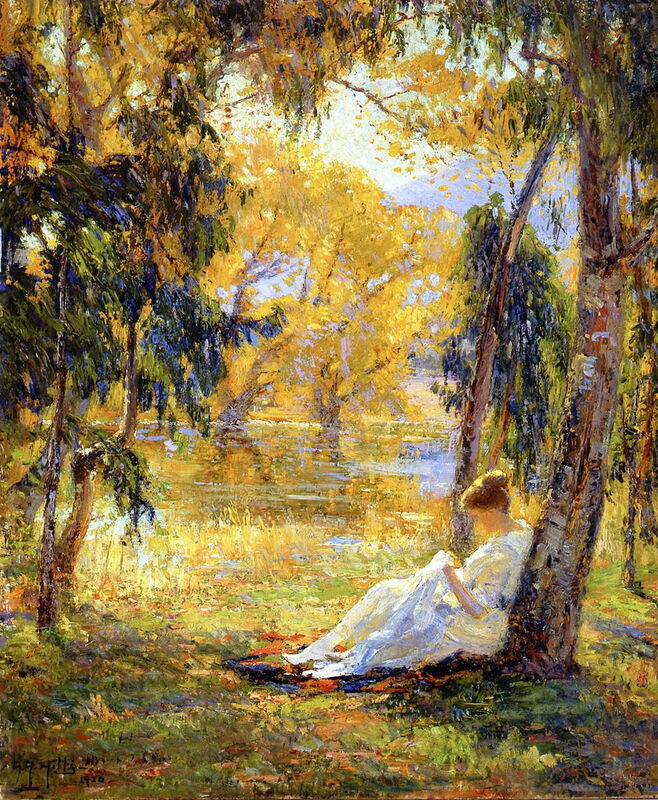 Closer to home in Laguna Beach, her Fall, Orange County Park (1916) is a classic and highly accomplished plein air painting which appears to have been made with extensive and deft use of the knife, particularly in the foreground. Hills was very active in the community, and in 1918 was one of the founders of the Laguna Beach Art Association, and remained an active organiser for the rest of her life: she was its president for six terms in all. That year the town’s first art gallery opened, later to become the Laguna Art Museum, with an exhibition of nearly 100 paintings by 25 artists. Hills led the later fundraising to build a permanent gallery, which opened in 1929 on Cliff Drive. Her work was exhibited at Los Angeles County Museum of Art in 1919 and 1924, and at the Panama-California Exposition in San Diego. By the 1920s, her plein air paintings, such as her superb contre-jour Frances (1920), were decidely Post-Impressionist. 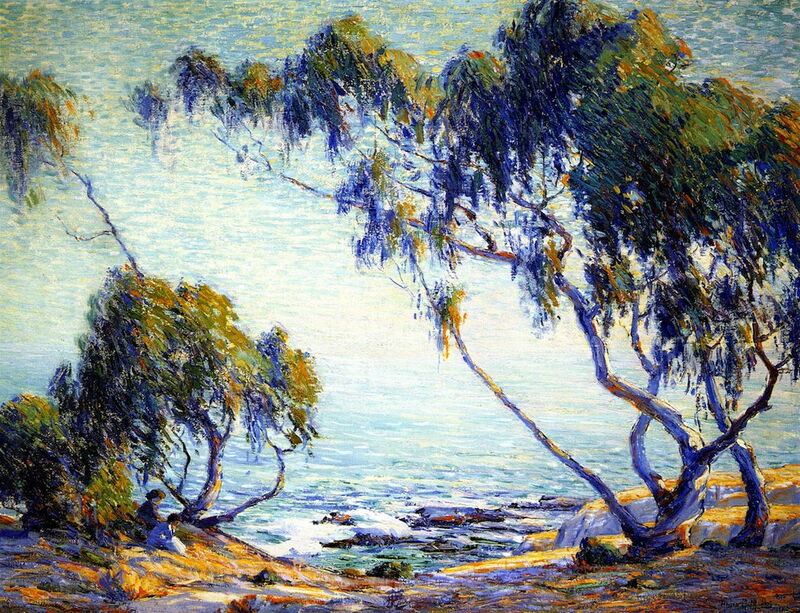 Of her many paintings of the coast, I think Spell of the Sea (also known as Laguna Beach, near Moss Point) (1920) must be among her best, and compares well with those being painted on the south coast of France at the time. 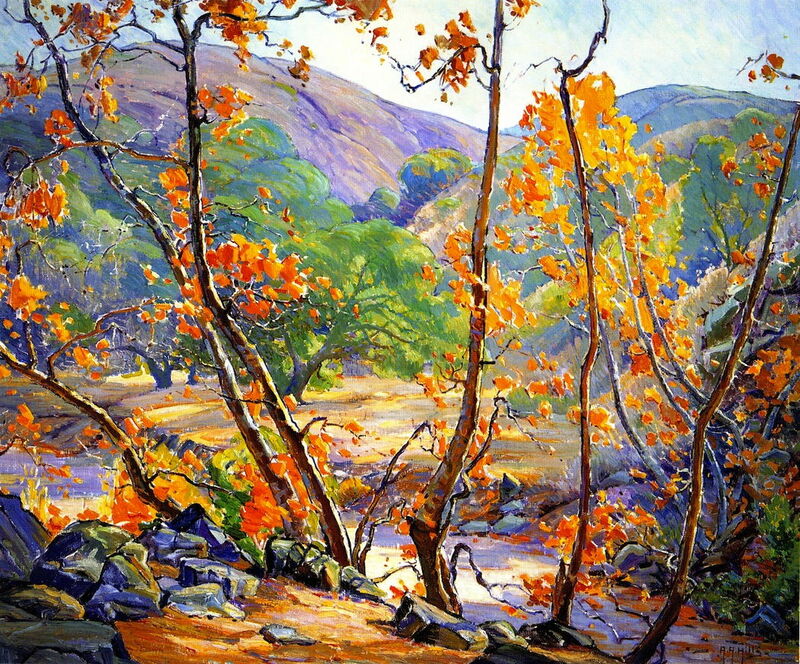 Anna Althea Hills (1882-1930), After the Storm, Hemet, California (1922), oil on panel, 50.8 x 61 cm, Laguna Art Museum, Laguna Beach, CA. The Athenaeum. 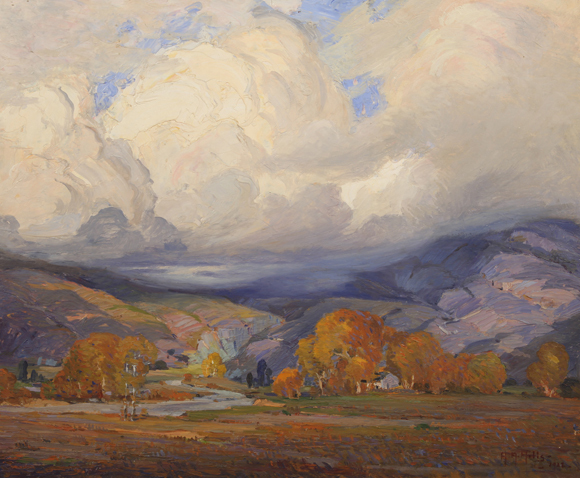 After the Storm, Hemet, California (1922) is a slower, more finished studio work, probably based on quick plein air sketches. Hemet, and its conjoining city of San Jacinto, are far inland, in the San Jacinto Valley, well to the northeast of Laguna Beach. 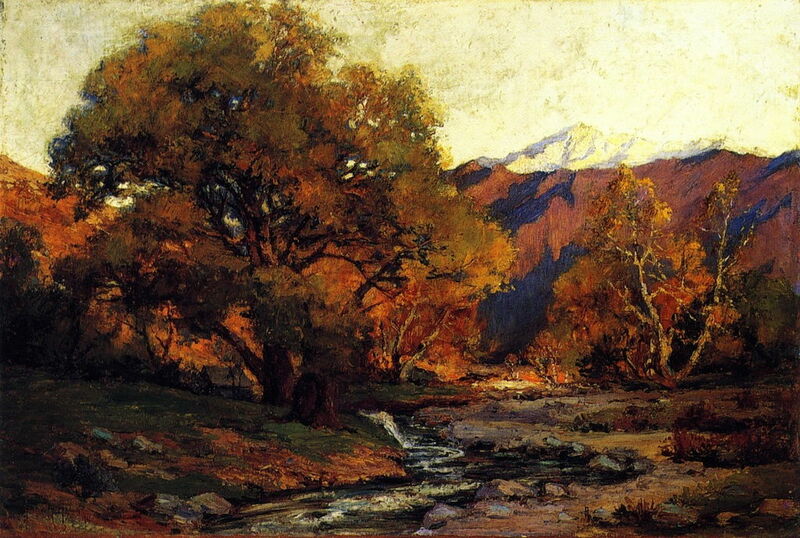 Anna Althea Hills (1882-1930), Mount San Jacinto (date not known), oil on canvas, 50.8 x 76.2 cm, Private collection. The Athenaeum. I suspect that Mount San Jacinto (date not known) may have been painted during one of Hills’ earlier trips inland to the San Jacinto Valley. 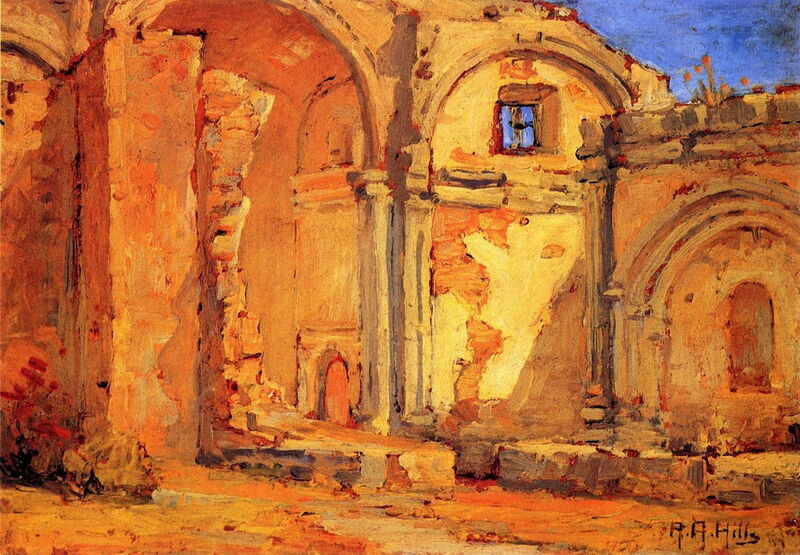 Anna Althea Hills (1882-1930), Ruins of the Chapel, Capistrano (date not known), oil on board, 17.8 x 25.4 cm, Private collection. The Athenaeum. Ruins of the Chapel, Capistrano (date not known) is another of her quick plein air sketches, showing the ruined buildings of this mission to the southeast of Laguna Beach. It was one of her favourite locations for painting outdoors. Anna Althea Hills (1882-1930), Sycamores (date not known), oil on canvas, 76.2 x 101.6 cm, Private collection. The Athenaeum. Sycamores (date not known) shows her rich use of colour and marks in challenging light. She had apparently suffered a “severe spinal injury”, although it did not prevent her from continuing to sketch and paint out in the Southern Californian countryside. She died in 1930; although most of her paintings remain in private collections, some works are in Laguna Art Museum, Bowers Museum, and The Irvine Museum. Anna Hills would, I am sure, have been the first to admit that she was no great master, comparable with Monet (who died only four years before she did). But she is an excellent example of the many fine artists who were the first to find the light of Southern California, who established plein air painting as a popular activity, and who started to redress the balance with men in art. For the rest of us, her paintings remain not just more affordable, but also more accessible – the sort that we might aspire to have in our own homes. Hers is an art which we can aspire to in our own painting, perhaps. She also surely deserves a place in the history of the art in which we engage – the people’s art. Trenton, P ed. (1995) Independent Spirits: Women Painters of the American West, 1890-1945, University of California Press. ISBN 978 0 520 20203 0. Posted in General, Painting and tagged California, hills, Impressionism, knife, plein air, Post-impressionism. Bookmark the permalink.